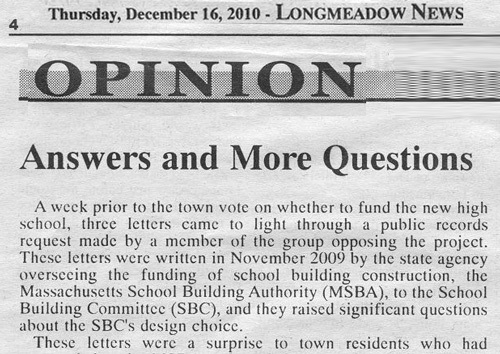 I read Alex Grant’s column in last week’s (December 16) edition of the Longmeadow News (click here to read complete column) but was not surprised to learn that his recent FOI request to the Town of Longmeadow for additional documents relating to the series of SBC/ MSBA correspondence and meetings in November 2009 did not reveal any new information nor any insight as to why the MSBA withdrew at the last minute their concerns (build "new" vs. renovation) for Longmeadow's high school project. Click here to view all of the documents obtained through this latest FOI request. There was an important project meeting between the MSBA and the Longmeadow SBC at the MSBA headquarters (at Longmeadow's request) on November 16- two days before the MSBA Board was scheduled to make their decision on the Longmeadow project. This meeting was viewed as critical for the project with 15 representatives from Longmeadow (including SBC members, project architects, and local politicians) in attendance. However, it is quite surprising that no meeting minutes or other published notes were taken by either side (or at least not made public through two separate FOI requests). The only documentation obtained through the latest FOI request were a series of letters including one (11/17/09) from the School Superintendent thanking the MSBA for the opportunity to present Longmeadow’s information and hoping that it was sufficient for a positive recommendation to the MSBA board on the next day (11/18/10). Click here to view this correspondence. Meeting minutes for the two SBC meetings that took place in November 2009 (11/05/09 + 11/19/09) revealed very little about the SBC/MSBA project correspondence, "renovation" vs. "build new" concerns or discussions that took place. Followers of the Buzz blog know that I was a strong supporter of the school building project until April 2010 when it became apparent that the financial impact on increased property taxes for a new school might become a significant hardship for many residents in town and I publicly spoke out in favor of renovation vs. new construction. From the beginning of the high school building project activities in June 2009 and through early June 2010 I provided significant IT support to the SBC by creating and maintaining the SBC website which helped keep residents updated and informed about the project. As the project moved forward, there was no question that the vast majority of town residents believed that we needed to do something about the condition of our high school. What prompted me to write the blog post in early June 2010 that got me fired as town webmaster was that this entire critical interaction between the MSBA and the SBC in November 2009 was virtually hidden from public view until just prior to the town vote in early June. When town employees or elected or appointed officials believe that the "end result justifies the means" and that hiding critical project issues from public view is acceptable, this becomes an issue of public trust and transparency in our town government. This controversy was not about a YES or NO position on the high school building project. Thank you Alex Grant for trying to get the rest of the story…. I guess that we will never know what really happened. The Longmeadow Buzz blog has been following the actions of the Longmeadow Select Board on Monday nights for quite some time and the proceedings can sometimes be pretty entertaining as well as informative. The LongmeadowBuzz provides town residents with information that is not normally found in the Springfield Republican or the Longmeadow News. Not just opinion but background information and facts so that the reader can make up their own mind about the subject. The LongmeadowBuzz blog is also not intended to be "one man's opinion" so other postings are always welcome as long as the author identifies himself. Stay tuned...I will continue to watch and comment on the actions of the Select Board.